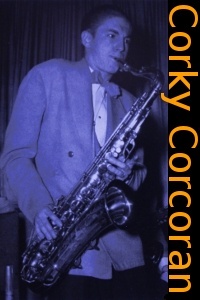 Corky Corcoran CDs @ Hep Records, jazz in depth from the 1930's to the present day. For the first half of the twentieth century the two men who have most influenced the tenor saxophone as an important jazz voice were Coleman Hawkins and Lester Young. The trumpet as pioneered by King Oliver and subsequently defined for all time by Louis Armstrong was the first instrument to achieve ensemble pre-eminence. But by the mid and late 20s through his long residency with Fletcher Henderson's band the rich tonality and fluency of the Hawkins horn challenged Armstrong's solo supremacy. Then in the mid 30s along came a quite different tenor saxophone tonality plus improvisational brilliance and this was Lester Young with Count Basie's band. These men remained the models of tenor sax jazz expression till in the late 50s and early 60s when John Coletrane established his ascendency. In Washington State up in the Pacific North West a slightly built teenager called Gene "Corky" Corcoran was perfecting his tenor sax style based on his hero Coleman Hawkins. His reputation spread out from his native Tacoma and by his sixteenth birthday in 1941 he joined the very successful Harry James Orchestra. In fact to allow the youngster to go on tour with the band the leader had to become his legal guardian. He remained with James throughout the war years and gained an even greater reputation as a soloist not only due to his musicality but his extraordinary powers of endurance and invention in his capacity to take chorus after chorus. Not till Paul Gonsalves with Duke Ellington in the mid fifties was there an equal in that arena. As the war neared its close Los Angeles had become a hubtown for many bigbands appearing in the many ballrooms in the area and of course the film studios. During this time Corky in company with some leading sidemen from bands in the area played jazz clubs and also recorded for the burgeoning independent record labels. The quality of these sessions is exemplified on the Hep CD "The Lamplighter All Star Broadcasts" from May 1945. On this CD Corky performs "Talk of the Town" which was a ballad that became the best known of his preferred repertoire and reveals the other side of the "Hawkins" influence full of tenderness and great sensitivity. He made a few sides with a small band around this time but never broke away from big band work. Had he struck out on his own and with astute management he might have become a bigger star although the Lestorian influenced Stan Getz and Zoot Sims and the other cool school tenor men were now gaining acceptance and the Hawkins followers were no longer regarded as at the cutting edge. His association with James came to temporary halt in December 1946 when the trumpeter leader broke up his band. However a few months later an equally famous leader, Tommy Dorsey, reformed and engaged Corky as his tenor sax star. A fine example of the boiling energy he brought to Dorsey is the extended "Well Git It" on "At The Fat Mans" Hep CD43. By the end of 1947 Corcoran rejoined Harry James with whom he would remain with a few breaks for the next 25 years. Harry's band in middle 50s throughout the next decade was a thoroughly Basie influenced organisation with many Ernie Willkins arrangements which suited the fundamental jazz core of Corky's musical being. Unfortunately life on the road with a touring Orchestra brings temptations and challenges and sadly Corcoran fell prey to alcohol. He joined AA and for the remaining twenty years of his life beat that demon, but could not beat the throat cancer which caused his death. He died in St Joseph's Hospital, in his hometown of Tacoma on 4th October 1979. "with Lamplighter All Stars 1945"
Outstanding mainstream jazz from 1945 featuring two giants of the tenor sax Corky Corcoran and Lucky Thompson. Titles - Sweet Georgie Brown / These Foolish Things / Honeysuckle Rose / Body and Soul / Sweet Georgia Brown(2) / Talk of the Town / Tea for Two / Royal Garden Blues / Body and Soul / I Got Rhythm. Corky Corcoran - "Body and Soul"